If you think you have a sprained foot, you want to get to the doctor as soon as possible. That could take anywhere from a few hours to a day, however, and may require some treatment in the meantime. Sprains are uncomfortable but not life-threatening. They may prevent you from performing physical activity, restrict your movement and cause discomfort, but with the simple treatments described in this article and enough time, you’ll be back on your feet in no time. If you happen to tear one of your ligaments, this is medically known as a sprain. It can take some time for a ligament tear to heal, so it’s important you follow the treatment plan accordingly. However, what type of treatment you do depends on the severity of your sprain. Sprains can range from Grade I to Grade III. Grade I: Mild – A slight injury composed of microscopic tears or stretched ligaments. Grade II: Moderate – A more serious injury; often features partially torn ligaments with more acute stretching. Grade III: Severe – The ligaments are entirely torn, rendering the foot unstable and unable to bear weight. A sprained foot can be one of the more difficult injuries to work around. Unlike an arm or back injury which leaves the rest of your body relatively unscathed, the foot bears your body’s entire weight every time you walk on it. 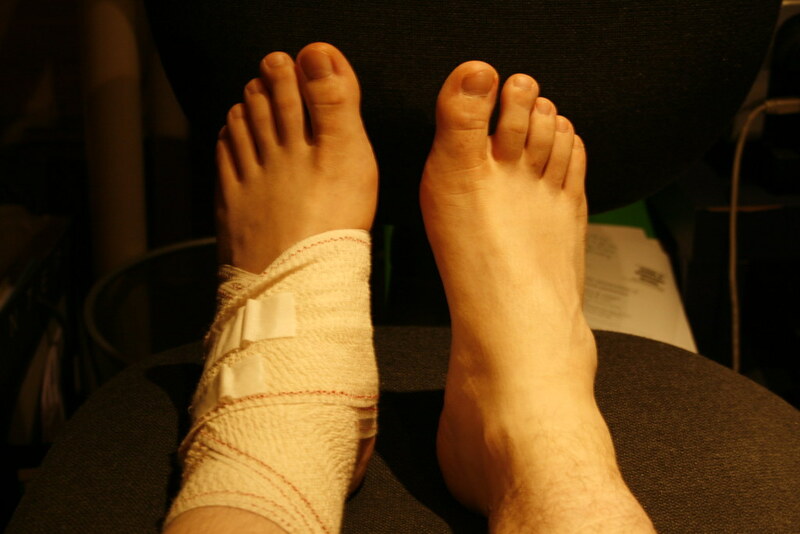 A foot injury, then, becomes a cumbersome annoyance when trying to perform even the simplest tasks. However, even though the foot contains several bones, nerves, and joints, foot sprains are relatively rare, surprisingly. The only individuals who have a high tendency for foot sprains are certain athletes or dancers whose activities require regular abnormal twisting and bending motions. Where Do Foot Sprains Occur? There are two distinct areas where sprained foot generally occurs: the joint at the base of the big toe and the midfoot. If an individual hyperextends the big toe, bending it extremely backward, it results in the specific turf toe form of a foot sprain. What generally happens is that a ballet dancer or a football player falls forward while the big toe is rooted flat against the ground. For ballet dancers, this occurs often because the tip of their pointe shoe is sturdy and rigid. While the rest of the shoe is lightweight and flimsier. This allows their big toe to remain stationary while not providing enough protection for the rest of their foot. Football players deal with the same issues, especially when wearing lighter, soccer-type shoes and playing on an artificial field. Symptoms: Pain and swelling at the base of your big toe. The central area of the foot that includes the arch is known as the midfoot. For ballet dancers, a midfoot sprain typically results from a dancer losing balance while dancing en pointe, or using the tips of the toes to dance. If dancers spin or jump and then land with their foot rotated or flexed in an abnormal way, it can result in a sprained midfoot. Similarly, athletes who ride horseback, snowboard, windsurf or dive competitively also risk a sprain. This occurs during their activity due to colliding, falling or otherwise twisting their midfoot. Unlike sprains to the first metatarsophalangeal joint, about a third of sprains to the midfoot happen. Specifically, individuals who aren’t engaging in high-risk behaviors like dancing or sports. Instead, these folks may twist their foot while falling, stumbling or tripping. Other times a person may get in a traumatic accident. Particularly, like a car accident or fall, and severely sprain their midfoot. Traumatic collisions of this caliber often lead to Grade III-level sprains, open wounds, and bone fractures. Symptoms: Swelling and tenderness in your midfoot area, and potentially bruising as well. If the sprain is closer to a Grade III, you may not be able to put weight on the foot. What’s the Best Treatment for a Sprained Foot? The best method of treatment for your sprained foot depends on how severe your injury is. The goal of treating a sprained foot is to reduce swelling and pain. Also, to encourage the ligaments to heal and restore your ability to bear weight on the foot. If the sprained foot is more severe, you may have to see a doctor or other medical specialist. Even more, such as an orthopedic surgeon, who will be able to help you further. More severe cases may require medicine and physical rehabilitation. If you have any doubts while reading the different treatment options or your symptoms do not go away. Further, this does not hesitate to contact your doctor or other medical professionals immediately. However, if your case is Grade I-II, mild to moderate, there are several treatment options for self-care that you can complete at home. Stay off your feet at all costs and avoid putting weight on your foot. Steer clear of activities that require movement as these may worsen swelling, pain, and discomfort. Every two to three hours use an ice pack or ice bath for twenty minutes. Most doctors even recommend using frozen vegetables as they conform to the shape of your foot better than ice packs can. Those with diabetes or vascular diseases may need to discuss ice application with their doctors before, however. Use an elastic bandage to compress the foot in order to decrease the swelling. However, don’t wrap the area too tightly or you could obstruct the circulation in your foot. Always start wrapping at the part of the foot farthest away from your heart. Keeping your foot propped up above the level of your heart will help reduce swelling. Additionally, the power of gravity can cause excess fluid to drain out and lessen the swelling further. Over-the-counter pain relief medications can be exceptionally helpful in reducing pain and swelling. The best and most common options are nonsteroidal anti-inflammatory drugs. Specifically, like ibuprofen (Advil, Motrin IB) or naproxen (Aleve). These drugs reduce both the pain and swelling of your foot and enable you to relax further or sleep. Other medications like acetaminophen (Tylenol) can reduce pain but won’t help with the swelling. Especially during the first few days, walking on a sprained foot is not recommended. Certainly, not that you would want to, as it can prove very painful. You may want to use crutches to walk for the first week or two while you’re recovering. After the pain and swelling go down, you may want to use an elastic bandage or a foot brace. Or, wrap sports tape around your foot. If your sprain is closer to the severe side, your doctor may recommend you use a walking boot or a cast. That way your foot can remain immobile while the ligaments heal inside. For the first two to three days, you always want to use cold temperatures on your foot, whether it’s ice packs, ice baths, frozen gel packs or frozen vegetables. Hot temperatures early on can actually increase the swelling. However, after the 48- to 72-hour mark, hot temperatures can loosen up the muscles. Also, the ligaments and further soothe your pain. Many individuals even contrast hot and cold temperatures for the ultimate swelling and pain relief. After two weeks or so, the swelling and pain of your sprained foot should have subsided enough for you to walk on the foot at a slow pace. At this point, your doctor may recommend you start doing stretches and exercises to restore your foot’s ability to move and bear weight again. Your physical therapist or doctor can explain the exercise regimen and the proper method of performing them. Different exercises will work on different aspects of your foot’s abilities, including strength, motion, stability, and flexibility. One of the most important parts of physical therapy is regaining the balance and stability in your foot in order to retrain its muscles and ligaments to work together to support your body and prevent a sprained foot from recurring. There are many treatment options available for you to deal with a sprained foot. It’s important to always check with your doctor as soon as you think your foot sprain has exceeded all but the most minor level (Grade I – Mild). Many of the treatments described in this article can be used in combination with what your doctor prescribes. Ultimately, wait a few hours or a day before seeing the doctor these treatments for your sprained foot. This keeps the swelling and pain at bay before getting the full diagnosis.